When one of cricket’s greatest benefactors, the late Sir Paul Getty, decided that he wanted his own ground, his estate at Wormsley in Buckinghamshire already provided him with a setting as magnificent as any in the world. To make his dream come true no expense was spared in creating an outfield and square fit to host international cricket. Throw in Jamie Oliver’s barbecued burgers and the festival atmosphere is complete. As a devotee of the women’s game, I had ring-fenced a day at Wormsley for the Test match in which England’s ladies would pit their skills against India. The occasion was fortuitously enhanced by engaging in conversation with a fellow senior citizen who turned out to be the grandfather of Natalie Sciver. ‘I’ve been a skiver all my life,’ he assured me, ‘but it’s pronounced sciver’ (rhyming with river). Later joined by Natalie’s delightful parents, I soon found myself meeting or renewing acquaintance with stars of the women’s game past and present. The players’ delight at engaging with their supporters is one of the added joys the women bring, and the previous year none had done more to warm the heart than Holly Ferling, Australia’s 17 year-old fast bowling prodigy, as she raced back to her position at fine leg to ensure extra time for a never-diminishing army of young autograph hunters. That year Wormsley had brought my season’s most memorable cameo, an innings from Sarah Taylor adorned by a pair of on drives that revived memories of Peter May. Sadly, in 2014, the idyll was compromised. England’s stroke-makers were reined in by India’s bowlers and in mid-afternoon play was brutally interrupted by a storm of tropical proportions. Posing as a customer for a new Rolls Royce was not strictly necessary to enjoy the shelter of the H.R. Owen marquee, and the rush for cover brought the chance to meet the legendary Enid Bakewell, the only England cricketer to have achieved the double on a tour of Australia and New Zealand. Also camping within the tent in more formal style was Isabelle Duncan, author of Skirting the Boundary, a history of the women’s game. I am supposed to be reviewing this book, and the conventions demand a measure of objectivity. In the past I have turned down requests to provide a critique when an author has been a personal friend, but on this occasion I have chosen instead to expose the background to how I came by the book, aware that my experience may have brought accompanying prejudices. I shall confess to having been charmed by the author and impressed by her obvious vitality and an almost certifiable dedication to the game of cricket. As the book’s dust jacket testifies, Isabelle is a graduate of Durham whose working life is devoted to running her own cricket coaching organisation. No bra-burning feminist, she captains an otherwise all-male team in the Surrey Downs League. 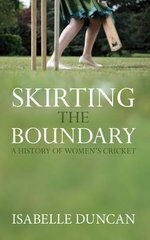 If you have no interest in women’s cricket, move on; but if you appreciate the delight of a game where the subtler arts thrive at the expense of balls bludgeoned into the stands, Skirting the Boundary is a must for your bookshelf. Any history, let alone one that sets out to cover the development of the game worldwide, runs the risk that the desire to set out all the facts and figures means that the readability of the book is compromised. Yet Isabelle Duncan’s engaging style, where colloquialisms are allowed to take centre stage at the expense of more formal prose, ensures that the book rattles along merrily. There was a jolt along the way as I encountered the occasional infelicitous phrase – ‘the emotional rescue of the English’ and ‘time waits for no one’ seemed out of place in their context. I then read the author’s impish admission: ‘Fortunately I have run out of Rolling Stones song titles to weave into my 1960s section without going completely over the top.’ Thanks to Google I identified the eleven songs readers had been challenged to spot in a couple of pages of text. The book’s opening chapter provides a brief resume of the earliest alleged references to cricket, moving swiftly on to the 18th century and noting where reports of women’s participation occurred. When it did, press reports devoted more space to playing apparel than to the on-field action. However, by the end of the Victorian era a few of the leading girls’ schools were starting to take the game more seriously, but there were still few opportunities for women to play thereafter. A long chapter headed ‘The Empire’ outlines how the women’s game became established around the globe, principally in countries now in the Commonwealth. Mostly it was all pretty haphazard with sensible funding a very modern concept and most likely to be found when women’s cricket has been welcomed into a common fold by the body governing the men’s game, as has happened with the ECB. By contrast, as late as the 1990s women playing cricket in public in Pakistan risked prosecution and death threats. A delightful chapter follows that illustrates the breadth of the author’s research and touches on some of the more improbable outposts of women’s cricket. In New Caledonia, where it was traditionally only women who played, the equipment sounds distinctly homespun, there are no conventional creases, overs are of one ball and matches must be officiated by men, who have the power to issue red cards! There is a chapter on ‘Superstars’, the stellar figures whose names are most likely to have percolated through to the general cricket fan: Myrtle Maclagan, Betty Snowball, Molly Hide, Mary Duggan, Betty Wilson, Rachel Heyhoe Flint, Enid Bakewell, Claire Taylor and Charlotte Edwards. Where, I wondered, was Janette Brittin, whose 27 Tests brought her an average of almost 50? Then I realised my own insularity. With Australia’s Betty Wilson a lone representative of England’s opponents, where were some of the others who had ensured that England have not enjoyed unbroken success: Debbie Hockley, Karen Rolton or Ellyse Perry? In the end I cannot cavil with the author’s choices, though the structure of the book might be questioned with so many of the highlights of the Superstars’ careers inevitably emerging again as succeeding chapters tell the story of the international matches. The first Tests were played in 1934/35 when Betty Archdale’s England party toured Australia, winning a three-match series 2-0 before moving on to trounce an inexperienced New Zealand side. Eileen Ash, the only survivor of the 1937 series, the first on home soil, recalls it all at the age of 101. If these early tours were great fun for all who took part, the ‘Tour Rules’ for the visiting Australians underline the serious intent: no smoking, drinking or gambling, a 10 p.m. curfew on the boat, no accompanying husbands, friends or relations and, even then, not a word for the press. There is much to cover as the game has expanded in line with the men’s to embrace one-day and twenty over formats. Sadly Test cricket, for which the increase to four days’ play reflects the women’s skills, struggles for its survival with India’s match against England at Wormsley the first the visitors had played for eight years, while Charlotte Edwards’ 19 years of international cricket have brought her only 22 Test caps against 180 appearances in ODIs and 129 in Twenty20. When she began she paid for her own blazer; now she is professionally contracted. The shorter forms of the game help to make this more feasible. Some of the most intriguing and entertaining writing comes in the final chapters as the struggle to break down the barriers of prejudice within MCC is described. A youthful Isabelle Duncan herself adorned the cover of Wisden Cricket Monthly in an MCC sweater, while Heyhoe Flint mischievously applied for membership with the backing of Brian Johnston and Tim Rice among others as the campaign for female admission gathered momentum. It took three votes before Colin Ingleby-Mackenzie’s tenure as president was crowned with success in 1998; but it must still have required some courage to sit outnumbered in the Long Room as Isabelle soon discovered when accosted by ‘a cantankerous old goat’ who demanded to see her pass some four years after the vote had gone the women’s way. The book is nicely produced with a beguiling cover and proof reading of the highest order, but it came as a surprise and disappointment to the author and a continuing frustration to your reviewer to find that there is neither an index nor a statistical appendix. A book of this kind is crying out for a summary of head to head records in the three formats and a few lists of top 20s: most runs, most wickets, highest scores. Robson Press may not be a leading publishing house, but nor is it a one-man band and the only reason I can advance for these omissions is laziness.